1959 Ad Columbia Sports Bikes Westfield Manufacturing Company, Westfield, Mass. Home > Ads and Magazine Articles > Bicycles, Motorcycles & Scooters > 1959 Ad Columbia Sports Bikes Westfield Manufacturing Company, Westfield, Mass. This is an original trimmed 3"x2 1/4" 1959 color illustrated ad from a comic book for "Columbia Sports Bikes Westfield Manufacturing Company, Westfield, Mass." 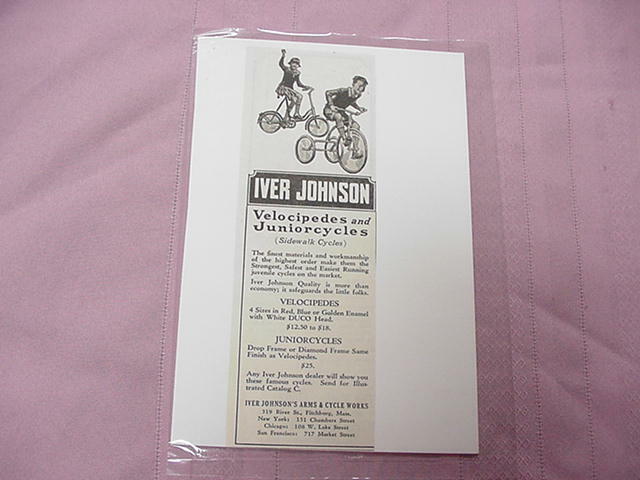 1930 Ad Iver Johnson Arms & Cycle Works, Fitchburg, Mass. 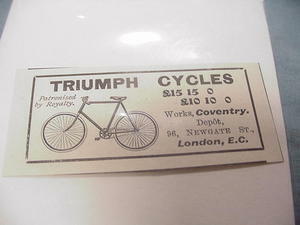 1889 Columbia Cycles Ad "Finest Line Ever Presented"
1900 Bicycle Ad Triumph Cyles, London, E.C.